While I’m waiting for the proof of BOSWORTH, I thought I’d start working on The Balance Part 2—The Wastelands and the Wilderness. 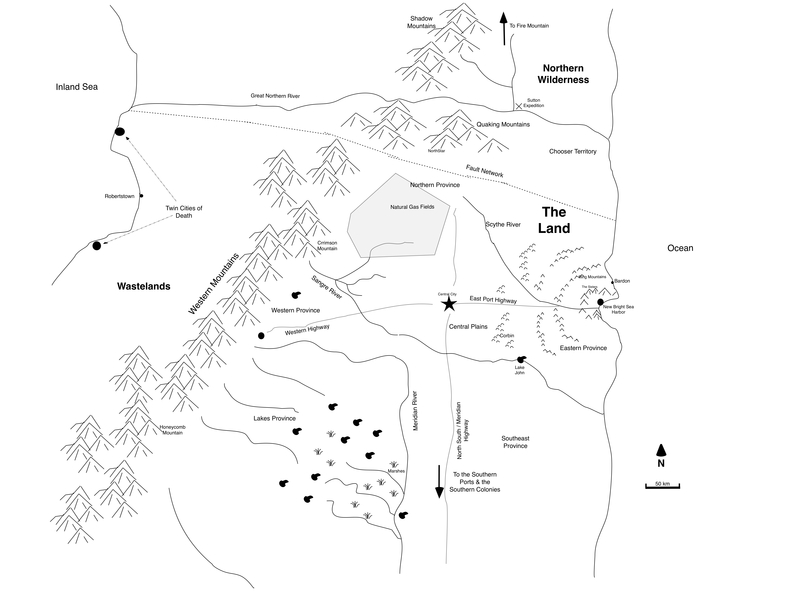 “The Land” escaped targeting during the war, and was protected from the worst of the destruction and much of the aftermath by the Western Mountains, a tall range of mountains that runs along the western border. Prior to the war, two organizations prepared for the war and positioned underground facilities in The Land, as well as other strategically selected places globally. One of these was ‘The Council of God’, an ecumenical group formed by the different Christian faiths, which also welcomed Islamic and Jewish groups into its membership. Together the member of this organization was determined to save and many lives as possible and then to lead people to a lead them to a more faith-based society, rooted in an agrarian economy and which turned its back on most technologies. The second organization was The Order, a group rooted in science and technology, and which had survived as a secret society for centuries. They were committed to creating human and technology time capsules globally, so that the survivors of the war wouldn’t have to start from scratch and could cut centuries from continuing the progress made before the war. But this group was also concerned about the spread of dangerous technologies and knowledge. They intended to provide education, the benefits of technology, but to closely hold core knowledge that might lead to the creation of more destructive weapons. The Order had a second purpose, as well. They were intent on advancing human evolution, too, and wanted to control how that evolution proceeded. To that end they created the Future Man Project, a set of genetic engineering programs intent on improving empathy, foresight, and the health of humans. These were the Healer program, the Sensitives Program, and the Prescient Program. Each program sought out and amplified key characteristics of the people involved and developed. The intent was to push these characteristics as far as possible and then to fold them back into the general population through planned breeding. The programs were all started about 50 years before the war and by the time the story begins (200 years after the war) they’d created beings with abilities that seemed almost supernatural. Following the war, the Council and the Order, realizing that they needed to work together to accomplish their missions, formed an agreement, called The Balance. It was a measure to retain control of technologies and dangerous knowledge while nurturing the faith based civilization and yet allowing The Order to provide access to technologies, including a monopoly on their control. In exchange, the Order agreed not to challenge the Council’s teachings and to assume a junior role in leadership. Suspicion and acrimony grew in the relationship from time to time, but the two organizations managed to keep the agreement for around 170 years. At that point the secret of the Future Man Project came out and a natural catastrophe was used as an excuse to purge The Land of The Order and of technology in general. Order members, and particularly the products of the genetics programs were rounded up and executed. A few members escaped and some lived on in the Council-controlled society, hiding who they were. One of these was Phoebe, the main character in the first book The Balance. Phoebe was from the Sensitives Program and she managed to hide in plain sight, living in the port town of New Bright Sea Harbor. Besides The Order, other people decided they didn’t want to live under the rule of The Council, and following The Purge, which drove the Order out, they escaped to the west, beyond the Western Mountains. People in the Land are told that the Wastelands are still hot with radiation and unlivable, but these escapees discovered that they could live there and formed villages and small towns along the coast of an inland sea. Far to the north, lay the Northern Wilderness, an area that had never been developed. Rugged and harsh, the Wilderness is also split by a chain of mountains and contains an active volcano that often produces fog-like conditions and makes portions of the north a dangerous place to visit. Part 2 of The Balance continues to follow the machinations of The Council and The Order. The Council wants to stamp out any remaining members of The Order. Meanwhile, The Order has been trying to find a way to assume their role in society and to reestablish The Balance. The story begins in The Land, where the Council is trying to find and destroy the active Order Cell that has been operating in The Land since the Purge.